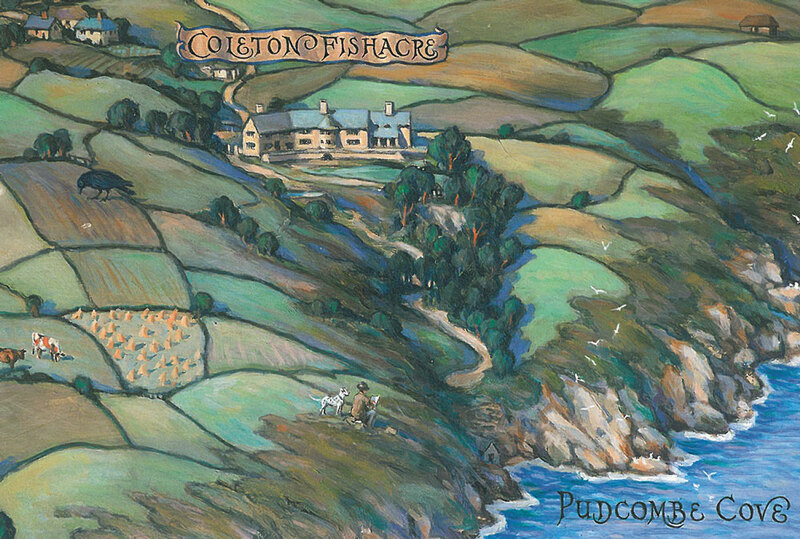 At Coleton Fishacre, by Pudcombe Cove, on the South Devon coast, we see a perfect, harmonious interplay of architecture and gardens and the greater landscape. The country retreat of Rupert and Lady Dorothy D’Oyly Carte began to be created in 1923. Rupert, the son of impresario Richard D’Oyly Carte, was the manager of the hugely popular—and profitable—Gilbert & Sullivan empire of operettas, as well as the owner of the Savoy Hotel and Claridge’s, in London. The Arts and Crafts-styled stone house and terraces were constructed largely from Dartmouth shale, which was quarried on site. On July 2nd, 2015, after a morning of dense fog and driving rain, the skies cleared, and Coleton Fishacre, which during the first hours of my visit had seemed to be a spooky Daphne-duMaurier-setting-made-real, was transformed into the glistening, cheer-inducing, jewel-by-the-sea that you see here, and which we will explore at length, in the final portion of this Travel Diary. Six months have elapsed since I published Part One about the summer-of-2015 week when my dear friends Anne and David Guy led me on a long ramble across Southern Devon. Of the varieties of jobs I perform, no work challenges me more, or gives me more satisfaction, than the creation of these Travel Diaries. With every article ( all of them composed after I’ve returned to my quiet New Hampshire life ) I try to replicate my virgin-views, and the excitement I felt, as I encountered each new place. Whenever I consider the backlog of material that I’ve already accumulated, I begin to frantically calculate just how many more decades I’ll need to stay alive, so as to finish the happy labors of this endless and self-assigned project. And yet….and YET: When I’m hip-deep in one of these extended periods of gritting teeth and summoning strength and practicing patience, I eventually realize that, so long as one remains calm and lucid, enduring awful times can result in the arrival of some of Life’s most unexpected gifts. To wit: Ten years ago, I sat by my father’s bedside, as he suffered through the final stages of Lupus. This was a man who during his 80 years had lived largely for and in the future; always beside him were spreadsheets about the businesses he’d build, and piles of handwritten notes about the organizations he’d grow. 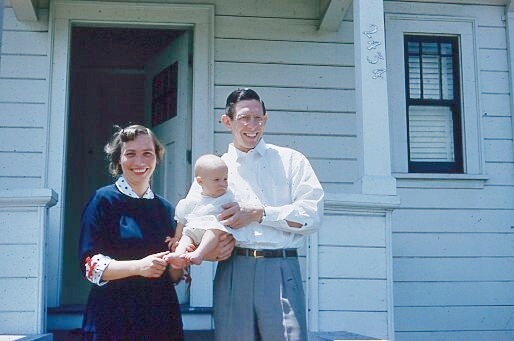 But, in his final weeks, my father stopped looking ahead and instead turned his eyes to his immediate surroundings. On an early morning in April I arrived at his hospital room with a freshly-baked baguette and a carafe of coffee. I spread butter on the still-warm bread, and gave it to him. I poured us each a cup of strong coffee, topped off with cream. For two months, as he’d been shuttled from one hospital to another, good bread and organic butter, and rich coffee and cream — along with all other tasty foodstuffs — had been denied him. But it was clear to both of us that his doctors, despite their frantic efforts on his behalf, could not stop his dying, and so I decided to end my father’s dietary deprivations. Now, having been shepherded through this recent, rocky stretch by my superb sister, by my small mob of beloved friends, and by a very smart doctor [Note: If you’re seriously ill, haul yourself off to Massachusetts General Hospital, in Boston…don’t waste time going anyplace else.] , my brain-fog has lifted and I am once again finding the energy to savor the bounties of Life, and to think about my past and future travels. As the World seems always to be on the verge of going to Hell in a Hand-basket (one of my mother’s favorite laments), focusing upon the positive — upon all the ways in which we humans have improved ourselves and embellished our Little Rock — seems the best way to counteract our host of other, un-admirable tendencies, which, these days, are on full and distressing display, across the globe. And so, the most constructive thing I can do today is to resume my journal about more of the extraordinary places to which Anne and David led me last summer, in Southern Devon. Otto Overbeck bought his house, originally called Sharpitor, in 1928. Upon his death in 1937, the house and garden were bequeathed to the National Trust, with the stipulation that it should be renamed Overbeck’s. Image courtesy of The National Trust. 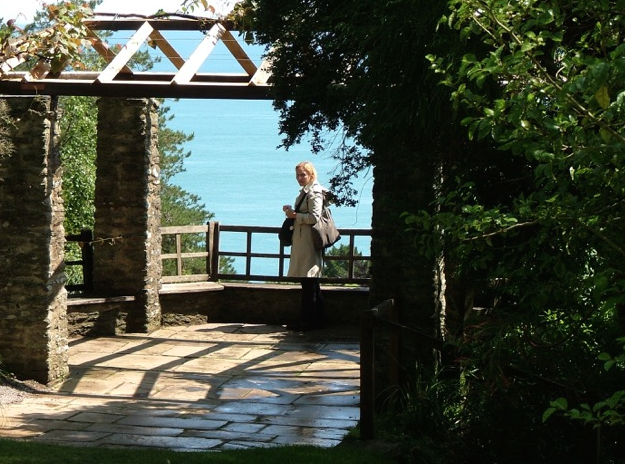 Overbeck’s is perched high above the Salcombe Estuary, and has views out over the English Channel. Aerial View of Overbeck’s. The road (if it can be called that) to Overbeck’s is winding and terrifyingly narrow…more a paved goat-path than a place for automobiles, however compact they may be. Unflappable as always, Anne Guy steered her vehicle upwards, with but a few sideways glances at the rock walls, and steep drops, alongside the steep approach to the House. Occasionally she played “chicken” with a car that was headed in the opposite direction: she nearly always won. 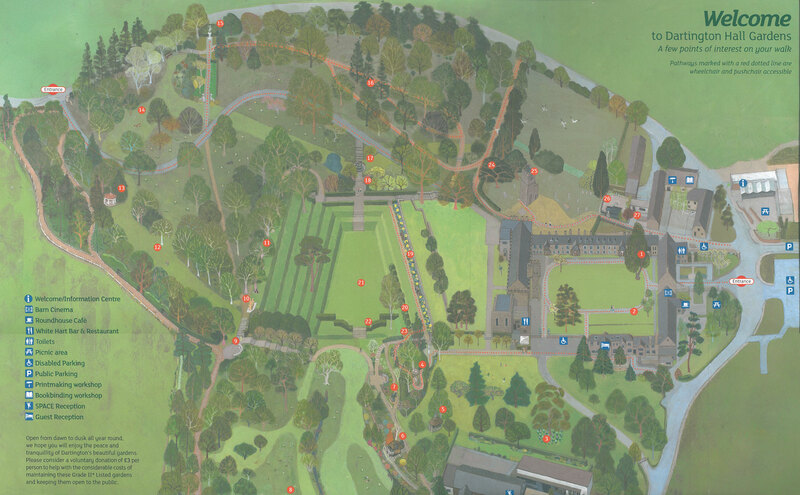 On display inside of the House: this aerial view of Overbeck’s. I’ve always maintained that creating a garden — especially one that is large and ambitious and which requires serious earth-moving at the outset — is an impractical and somewhat lunatic endeavor. It thus seems appropriate to introduce you to the first gardener in today’s Tour: Otto Christoph Joseph Gerhardt Ludwig Overbeck — in all of his Glorious Lunacy — as painted by Leonard Rosoman. Marmite, in my Yankee’s-opinion, is the black, gooey, salty spread which the English use to ruin their morning toast….utterly revolting! When a Brit describes something as “a bit Marmite,” he’s talking about an acquired taste. 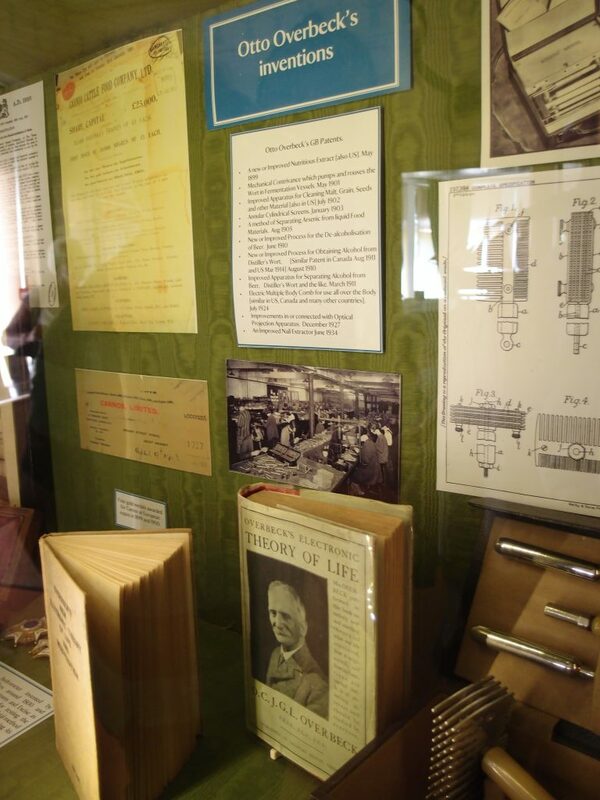 Displayed in the House: some of Overbeck’s inventions and publications. But, what matters today is that Overbeck’s inventions made him money; and those funds allowed him to add thousands of exotic and sub-tropical plants to the already-in-place terraces which Edric Hopkins, the first owner (from 1901 until 1913), had built on the rocky, cliffside site. the wrought iron railings have been painted to match, in what is called Overbeck’s Signature Blue. A flight of steps leads us downwards, through an avenue of Chusan Palms. A closer look at those fabulous wrought iron railings. I WANT THEM. Among the many peculiarities of the Southern Devon coast are its pockets of Mediterranean micro-climates. 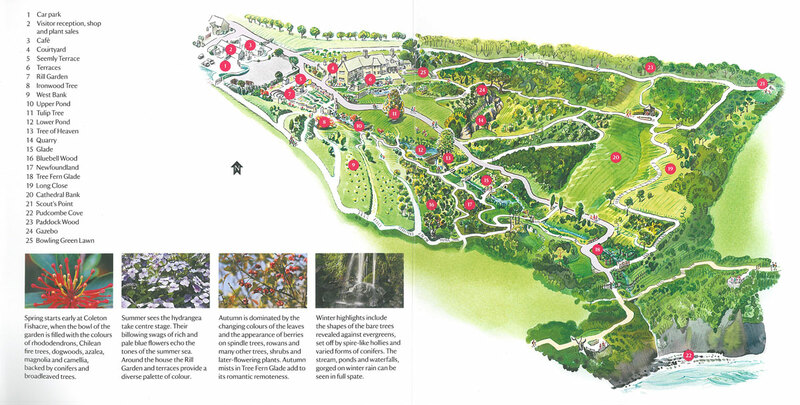 Taking advantage of Salcombe’s mild winters and warm southern breezes, Overbeck was able to embellish his 2+ acre garden with a huge range of decidedly NON-native plants : 3000 palm trees were added, along with bananas, oranges, lemons and pomegranates. Guided by his head gardener Ellis Manley, Otto nurtured plants which are native to tropical Asia, such as his camphor tree (Cinnamomum camphora), along with specimens from Africa, South America and New Zealand. When one remembers that Overbeck gardened here for a mere nine years before his death, his horticultural transformations of the property are even MORE stunning to behold. We arrived at 9:30AM, a half hour before opening time. Early Birds can linger on this terrace, with its stunning view, down the Estuary. This side of the House, seen from the entry area, is an anarchic combination of shapes and styles…which seem quite at home in Overbeck’s English Jungle Garden. Another view of Salcombe Estuary, from the entry area. A closer look at Salcombe Bay… more like California, or Italy, than England. The National Trust’s gardeners who today tend Overbeck’s rely solely upon rainwater and runoff collected from roofs for irrigation. State of the art composting provides all of the necessary mulch and fertilizer for the garden, which, though compact, feels vast because the site offers spectacular and varied views of the estuary and ocean. The plants at Overbeck’s, while exotic, are none of them sissies! Most survive without winter protection. And the free-draining soil, which is composed of millions of minute rock particles from the excavated cliff, ensures that root systems of the plants do not rot during England’s wet seasons. Whether by design or by chance, Otto Overbeck found the perfect place for his horticultural adventuring. Before we began our tour of the gardens, we enjoyed coffee and cake (there’s ALWAYS time to eat cake…) on the Tea Room’s Terrace. Detail of wall railing, on the Tea Room’s Terrace. Our bright-morning-sun Terrace view of Salcombe Bay. Palm Gardens below the Terrace cling to the steep slope. Inside the Tea Room proper, this painting by Leonard Rosoman, of Otto Overbeck in his garden, adorns the mantle. we discovered that the food was well-worth waiting for. Back outside, at our Terrace table, this Accomplished Beggar gave me Duck-Eyes. View of the House, from the Tea Room Terrace Lawn. The House, originally named Sharpitor, was built in 1913 (to replace an earlier structure). Shortly thereafter, the new owners, Captain and Mrs. George Vereker, converted Sharpitor into a Red Cross convalescent home for soldiers, in tribute to their 21-year-old son, who had been killed, just 22 days after the start of World War I. By January of 1919, the Verekers had welcomed 1020 wounded soldiers to their home; I imagine that the warm sunshine there, along with the incredible generosity of the Verekers, healed a good many men. Well-nourished, we headed across the Tea Room Terrace Lawn, towards the Upper Gardens. Image courtesy of the National Trust. A stone balustrade marks the path toward the Upper Gardens. Behind it, the Palm Gardens. We’re in the English Countryside? Every square foot of the gardens has been thoughtfully designed. In the Rock Dell, we were rewarded with this VIEW. 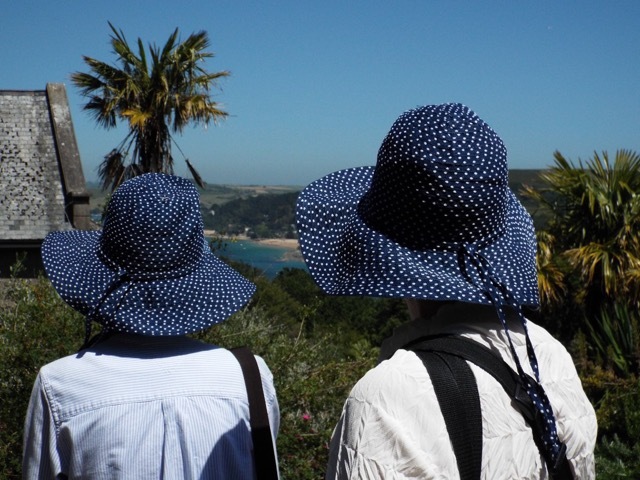 Anne and Nan in matching sun hats, on the English Riviera. Photo by David Guy. A path in the Rock Dell leads towards the little Gazebo Garden. The Gazebo Garden has a small, sheltered seating area. This hidden pocket of Overbeck’s is planted with cistus, and myrtle trees with cinnamon bark. From the Gazebo Garden, we take a closer look at the House chimneys. We’re back in the Rock Dell, where the incongruous combination of tall palms with blowzy hydrangeas is charming. A flight of stairs in the Rock Dell leads up, toward the Olive Grove & Picnic Area. Detail of handrail on Rock Dell stairs. The Olive Grove is planted at the highest point in the Gardens. Anne and David lead the way, to the top of the Olive Grove. Armchair Diary titled “An Idiosyncratic Survey of Sculpture in Gardens of the Western World.”). The Statue Garden predates Otto Overbeck’s ownership of Sharpitor. The statue in question, a bronze figure of a girl whose fingers originally supported a bird, was somewhat modified during the Second World War. Whereas the occupants of the property during WWI were convalescing British soldiers (and were thus guests who weren’t terribly rambunctious), the American soldiers who were stationed at the house during WWII were a friskier and less well-behaved bunch. The bronze bird in the hand of the bronze girl was too tempting, and soon became a victim of the soldiers’ target practice. Seems we North Americans, when stationed abroad and with time to spare, sometimes go a bit nutty with our firearms (also see my photo of the pockmarks left by Canadian troops’ buckshot blasting at the garden walls at Lullingstone Castle’s World Garden, in Kent, in my article “Rambling Through the Gardens & Estates of Kent, England. Part One!”). We enter the Statue Garden, which contains lush plantings of tender perennials: poppies, salvias, agapanthus, cannas, kniphofias, inulas and heleniums…all chosen as sources of food for the bees and butterflies who flock there, from early June through the end of Autumn. Anne and Nan in the Statue Garden. Photo by David Guy. A glimpse of the Statue Garden, from the Secret Garden. A magnificent Date Palm is planted at the center of the Secret Garden. View of the Greenhouse, from the balustrade of the Secret Garden. The Secret Garden overlooks this Parterre, which was planted by the National Trust in 1991. The clipped box hedging is cut twice a year, by hand. Another view of the Parterre. Orange and Lemon trees anchor the corners of this garden. path leading to the Banana Garden. Planted in 1901, the magnolia tipped over in the Winter of 1999 during a heavy rain, but, despite its topsy-turvy situation, the tree continues to show healthy growth. On display in the House is this vintage photo–circa 1901– of the Magnolia. The Banana Garden’s Greenhouse: painted in Overbeck’s Signature Blue. 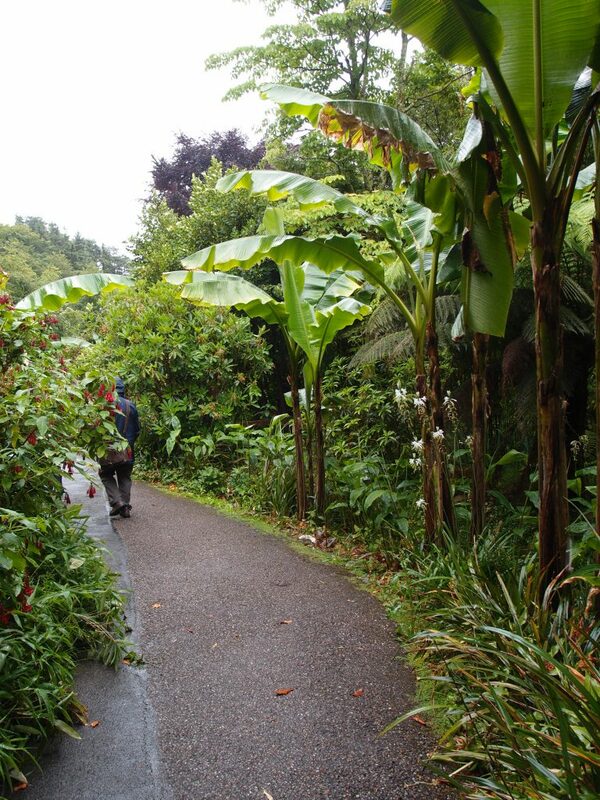 The Banana Garden is the most sheltered part of Overbeck’s. The bananas are one of the few plants in the gardens which need some added protection. Each Winter the stems are wrapped in fleece, and then covered with a mesh overcoat to keep some of the rain out. A Gate separates the Banana Garden from the Palm Gardens. Otto Overbeck planted his expansive Palm Gardens on a series of terraces which were built in 1901 by Edric Hopkins, the first owner of the property. A Gardener, tending the Palm Gardens. You can just FEEL the dry heat of that day, can’t you! The Palm Gardens sprawl across steep, gravelled banks and terraces. All of the Chusan Palms date from the 1930s, during Otto Overbeck’s residency. The Palms are complemented by plantings of Tree Echium, agaves, yuccas, ornamental grasses, and exotic flowering shrubs. View of the House, from the Palm Gardens. View of Salcombe Bay, from the Palm Gardens. A stand of Tree Echium, as we leave the Palm Gardens and approach the Woodland. The Woodland provides coolness and shade and, more importantly, a bit of decompression after all of the visual stimulation of Overbeck’s exotic plantings. This tiny woodland area shelters the rest of the gardens from cold north winds, and is composed largely of naturally-occurring beech trees and evergreen oaks. Self-portrait, by Otto Overbeck (born 1860, died 1937). Image courtesy of the National Trust. 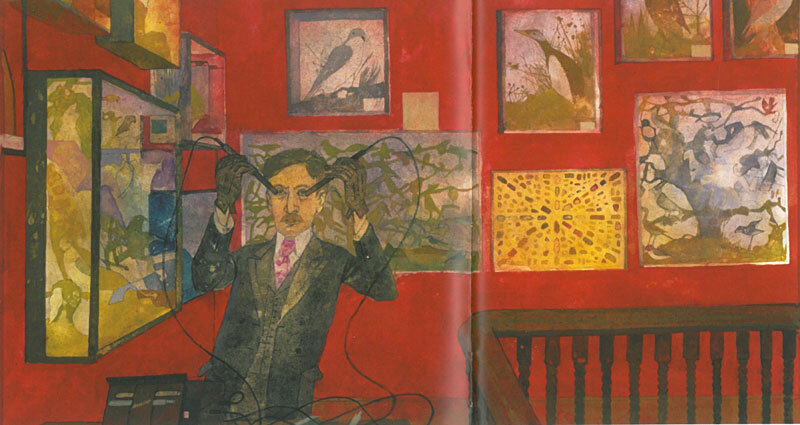 Until his End, Otto — chemist, collector, artist, inventor and plant maniac — operated at full throttle. Clearly, there was never a dull moment with Otto … not inside of his brain … nor outside, in his garden. Otto Overbeck didn’t just accumulate plants. Inside the House a small selection of his collections is on display. In the Staircase Hall are samples from his encyclopedic natural history collection: stuffed animals and birds and fish, birds’ eggs, fossils, and butterflies. The second floor landing, in the Staircase Hall. Hidden under the stairs is a room that’s full of the dolls’ houses which belonged to the Overbeck family. In Overbeck’s Maritime Room: a tribute to Salcombe’s 19th century glory days, when it was a busy seaport. The paintings and scale models on display here are a catalogue of maritime disaster: every ship shown was lost at sea. Otto Overbeck spent the final decade of his highly unusual life creating a garden which is nothing short of sublime. This was my parting-view of Overbeck’s, as Anne and David and I began to climb the stairs, back to the Main Gate. That such an Exit should be so seductive is almost perverse: leaving Overbeck’s that afternoon became very difficult for me. But, despite my foot-dragging, David and Anne declared “Onward!” ‘Twas time for a flying visit to the Beach at Bigbury Bay, and a view of Burgh Island. As I explained in Part One of my guide to Southern Devon, although she died in 1976, the presence of Dame Agatha Christie remains strongly felt, along the riverfronts and seacoasts of the area. Agatha Christie. Born 1890, Died 1976. Agatha Christie loved Southern Devon: she was born in 1890, in Torquay, and for the last two decades of her life she made her country home at Greenway, on the River Dart. Agatha cranked out 66 mystery novels, as well as collections of short stories, and a play: THE MOUSETRAP is the world’s most continuously-produced drama, with more than 25,000 performances notched up. For Christie-fans, there are various Christie-themed tours of her old stomping grounds in Devon, as well as the biennial International Agatha Christie Festival, which is held in Torquay. Having already taken me to Christie’s home at Greenway (see Part One of my Devon Diary), Anne and David thought I should also see the place in Devon which inspired her most famous mystery story. I was 12 years old when I first encountered Christie’s novel, AND THEN THERE WERE NONE. AND THEN THERE WERE NONE was published in 1939. I had the bad judgment to be reading it on a hot summer’s evening, while I was babysitting, in a large, strange house. I recall vividly how frightened I became, as Christie, with relentless precision, spun her tale of methodical, multiple murders. One got frizzled up and there was one. Christie’s rhyme is predictive: by story’s end, None remain on her Island (but of course there’s a Final Twist….). I have long since outgrown Agatha’s formulaic stories; lately I’ve been enjoying these better written and more subtle British mysteries: Christopher Fowler’s Bryant & May novels, and Ben Aaronovitch’s Peter Grant adventures. But I suspect that, even now, in my dotage, a re-read of AND THEN THERE WERE NONE would still give me the willies…and I would have quite a bit of company, as I shuddered. A-T-T-W-N has sold more than 100 MILLION copies, and is the world’s best-selling mystery novel, as well as the seventh-best selling book of all time. The Art-Deco-styled hotel which today perches on Burgh Island was built in 1929, expanded in 1932, and has recently been restored to its 30s glamour. Although Christie had already used the Island as the setting for her most successful story, Christie was unabashed about putting the place to use for a second time. 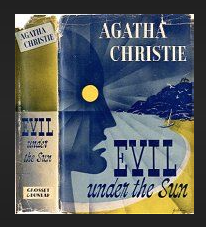 In 1941 she published EVIL UNDER THE SUN, a tale of a murder at the Jolly Roger Hotel (I cannot think of a more unsuitable way for Christie to have renamed this Art Deco jewel…); this time around, crime-solving was performed by Agatha’s fastidious Belgian sleuth, Hercule Poirot. Published in 1941. 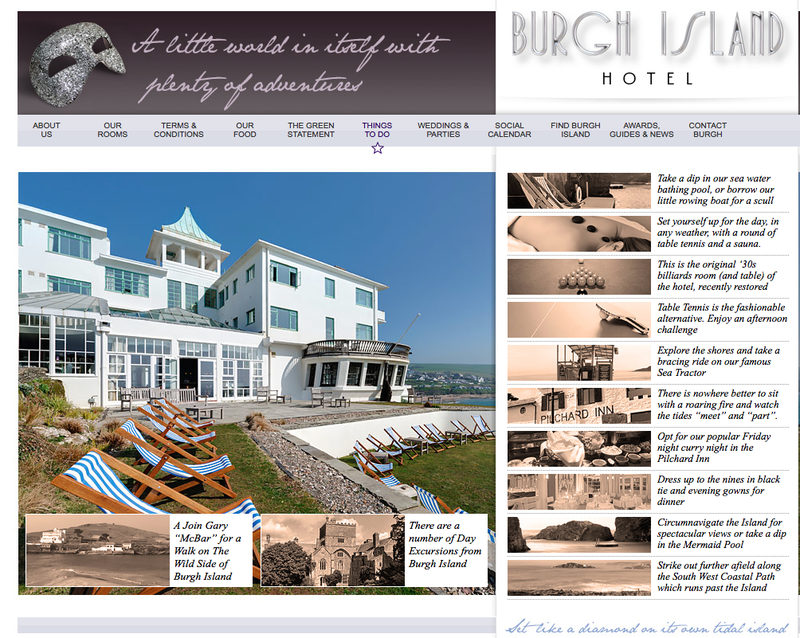 In this story, the Burgh Island Hotel was renamed the Jolly Roger Hotel. Burgh Island — a tidal island — is tethered to the mainland by a 270 yard long sandbar. At high tide, the sandbar is submerged, and visitors to the Island are shuttled back and forth on the famous Sea Tractor. Sun Worshippers at Bigbury-on-Sea-Beach. This beach is the largest sandy beach in Southern Devon. The original Sea Tractor was built in 1930; the current third generation vehicle dates from 1969. The Tractor drives through the water, its wheels getting good traction on the compacted sand of the ocean floor. It all looked a bit top-heavy and tippy to me, but it’s perfectly stable. Sea Tractor, almost back at the Hotel. a designated Area of Outstanding Natural Beauty. 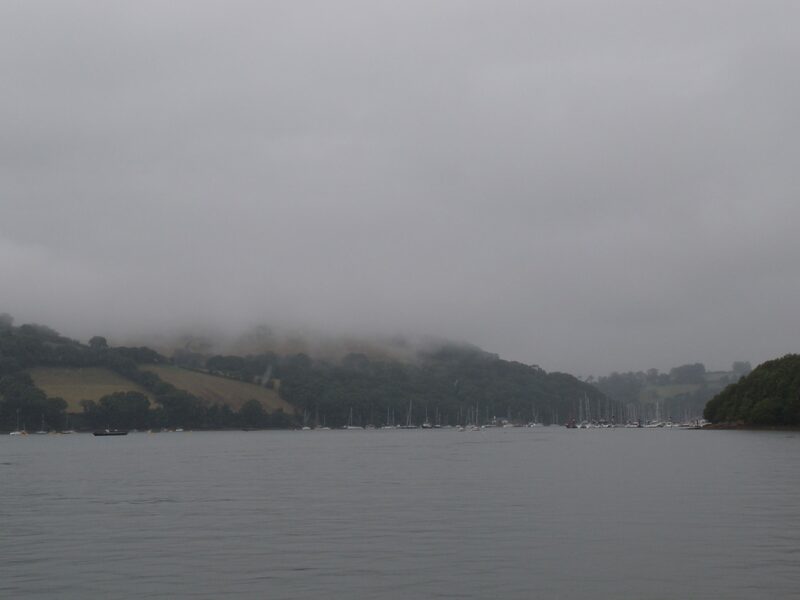 After the brilliant sunshine of the previous day, the fog and chill which greeted me when I awoke on the morning of July 1st seemed very dreary. The remedy? Cooking Therapy! I headed into the kitchen of our rented cottage in Dartmouth, and proceeded to bake a dozen of Nan’s Signature Scones. 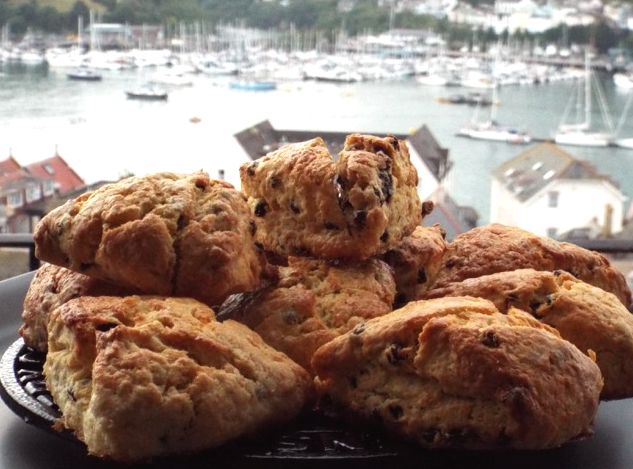 This American’s whipping up of scones while in Devon is, of course, akin to carrying coals to Newcastle. But my scones, which contain tea-infused currants and hefty doses of double cream, are Quite Fine, and I was not at all embarrassed to present them to Anne and David, for their breakfast treats. Nan-Scones, with Dartmouth Harbor in the background. Photo by David Guy. Baking, and then Feasting, had elevated my mood, and we set out, heading inland and northwards, towards nearby Totnes, and Dartington Hall. 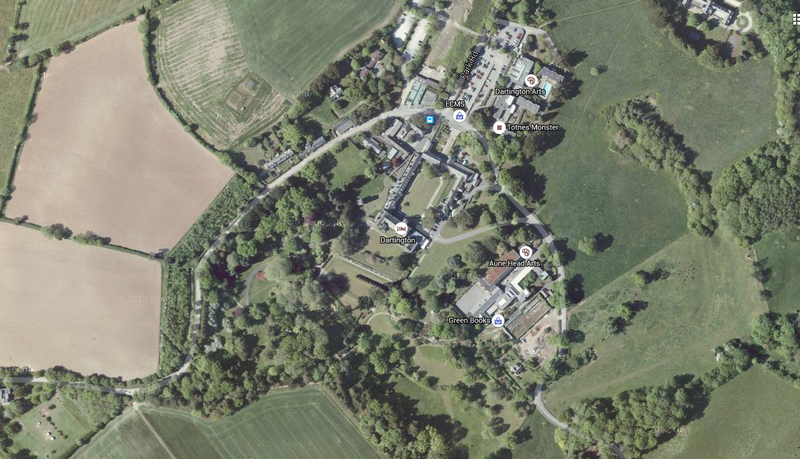 Aerial View of the Gardens at Dartington Hall, which are at the heart of the Estate’s 1200 acres. 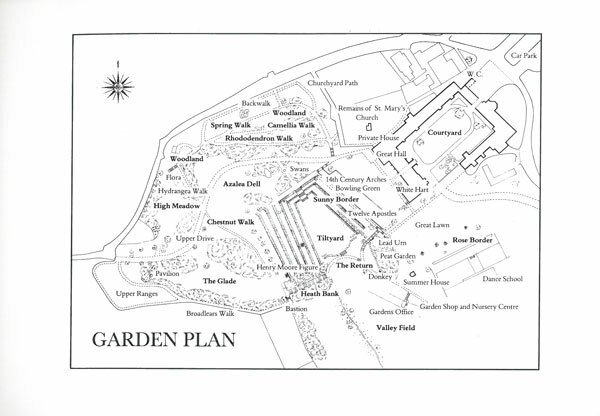 Plan of the Gardens at Dartington Hall. 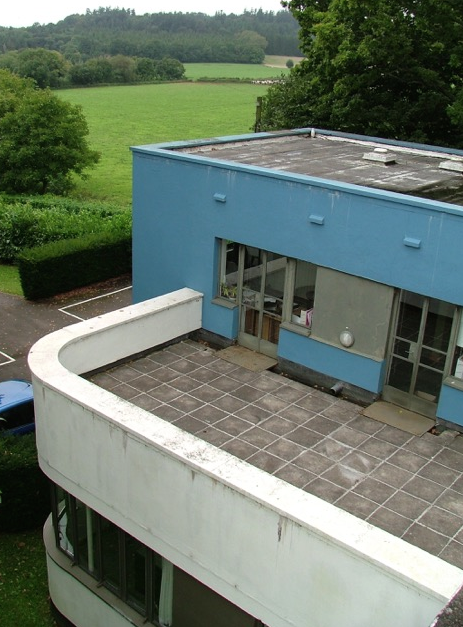 Image courtesy of Dartington Hall. 16th century, and the house was lived in by eleven generations of a single Devon family, the Champernownes, who managed the property for nearly four hundred years. Dorothy (born 1887, died 1968) and Leonard (born 1893, died 1974) Elmhirst. ( she had inherited her father’s fortune when she was only 17 ), Dorothy could do whatever she damn well pleased, and it became her pleasure to work with her new husband to create their own little utopia at the derelict Dartington Estate. Feminist, arts benefactress, social and labor reformer, garden designer, magazine founder (The New Republic), founder of schools (the New School for Social Research, in NYC; & 3 institutions at Dartington: a progressive coeducational boarding school, a College of the Arts, and an International Summer School)….Dorothy used her money productively, and also clearly had a ball while spending it. A portrait of Dorothy, in fancy-dress costume, by Walter Dean Goldbeck. Key Points in the Gardens, listed in the sequence, as you’ll soon see them. #2: Beatrix Farrand’s Courtyard Paving. #23: Garden Access Bridge, by Peter Randall-Page.#19: Sunny Border. Spanish Chestnuts. #10: Reclining Figure, by Henry Moore. #9: The Whispering Circle. #22: heath Bank Steps. #8: Valley Field. #7: Bronze Donkey, by Willi Soukop. #5: Garden Summerhouse. #4: Jacob’s Pillow, by Peter Randall-Page. In 1914, Beatrix Farrand, a long-time friend of Dorothy’s family, had designed a garden on Long Island for Dorothy and her first husband, Willard Straight. This explains why Farrand, who during her long career had never before been commissioned to design a garden in Britain, was summoned across the Atlantic by Dorothy: the design challenges at the Elmhirsts’ new home were daunting, and Dorothy wanted to work with someone she trusted implicitly. My long-time Readers will have seen my photo essay about Beatrix Farrand’s most acclaimed American garden: Dumbarton Oaks, in Georgetown (“Gardens & Estates along the Potomac,” published by New York Social Diary, in the summer of 2012). And I’ve done a survey of Farrand’s design contributions to the gardens at The Mount, in Lenox, MA: the home of her aunt, Edith Wharton (see my Diary for Armchair Travelers titled “Grand Gardens of the Berkshire Hills”). 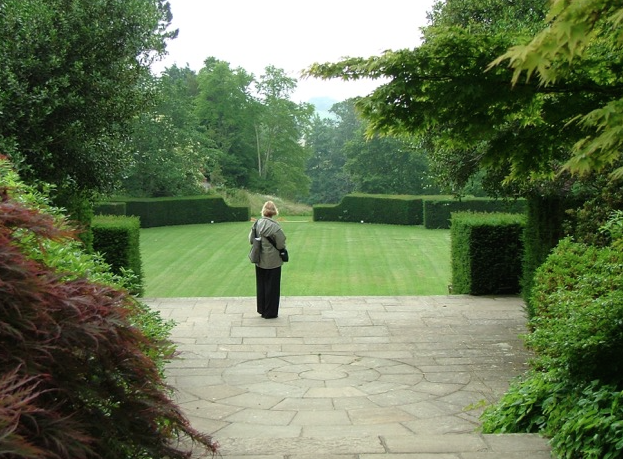 Dartington is the only known example of Farrand’s work outside of the United States, and we’ll begin our garden tour with her deceptively-simple Courtyard. What’s most remarkable about her work in Dartington’s Courtyard, and throughout the nearby Woodland, is its INVISIBILITY. 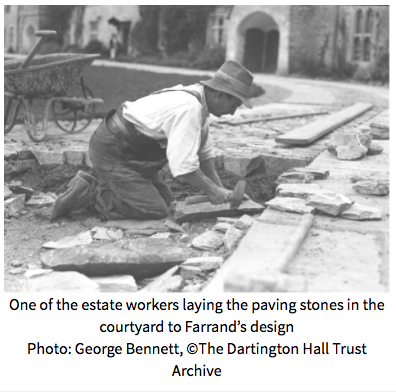 Farrand’s renovations to the Courtyard, and her creation of three naturalistic Woodland Walks, were so correct that a Visitor to Dartington feels as if she’s strolling through spaces which have existed, unchanged, for centuries. Such subtle and self-effacing work — and from such an acclaimed designer –is rare. We’re about to pass through the Great Entry Gate, and on into the Courtyard. The Courtyard’s Swamp Cypress, originally from Florida, was planted in the late 19th century. Transplanted to England, the tree has grown much higher than it would have, in its native Everglades. When paving stones were laid in the 1930s, care was taken to not disturb the roots of the Swamp Cypress. Farrand’s Courtyard drive circles a central lawn. The drive is paved with a mix of cobbles from the River Dart, stone flags, and granite setts. Circa 1933. Image courtesy of Dartington Hall. Courtyard drive, leading to the Great Hall. Photo by Anne Guy. Inside the Great Hall. 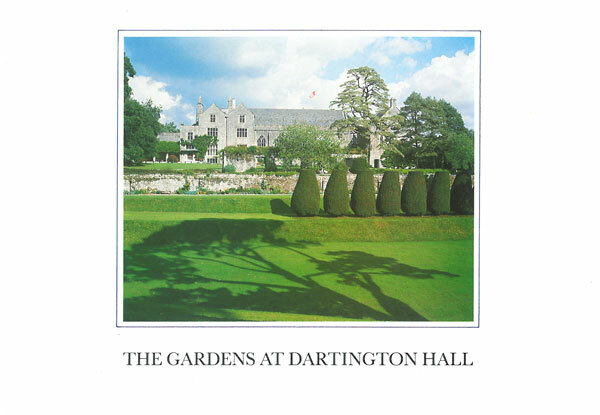 In 1925, when the Elmhirsts bought Dartington, only the walls of the Great Hall remained standing. Over the next 10 years, all of the Courtyard buildings were restored. Image courtesy of Dartington Hall. Behind the Great Hall, this George III lead urn marks the beginning of the gardens. The urn is thought to have been chosen by Beatrix Farrand. A Garden Access Bridge was installed in 2011 by Peter Randall-Page. Detail of Garden Access Bridge, which is made of oak, Blue Lias stone, and Devon Rustic Limestone. 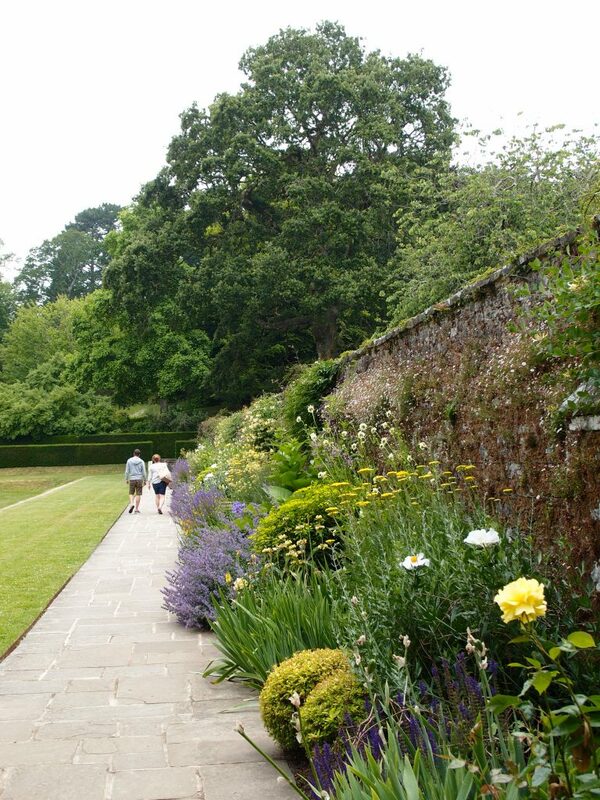 The Sunny Border hugs a high stone wall (which separates the Garden from a private bowling green that abuts the Great Hall) and spans the entire length of the eastern edge of the Tiltyard. Dorothy established this Border in 1925, and personally tended it for the rest of her life. Over the decades, designers Avray Tipping ( her consultant from 1925 — 1930 ), Beatrix Farrand ( 1933 until the start of WWII,in 1939 ) and Percy Cane (Dorothy’s designer from 1945, until her death, in 1968 ) advised Dorothy about her gardens, but the Sunny Border was her hands-in-the-dirt and day-to-day gardening obsession. After Dorothy died, this border in particular suffered. In 1985 Danish-born landscape architect Preben Jacobson (born 1934, died 2012) was brought in to revive the garden beds. He chose plants which flourish in sun-baked growing conditions, and devised planting patterns which rely upon evenly-spaced repetitions of plants where foliage or blossoms of yellow, silver, white, blue or purple predominate. Sketch of one of Preben Jacobson’s planting layouts for the Sunny Border. 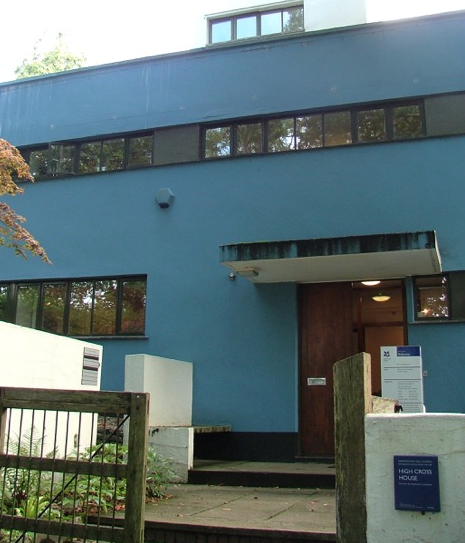 Image courtesy of Dartington Hall. 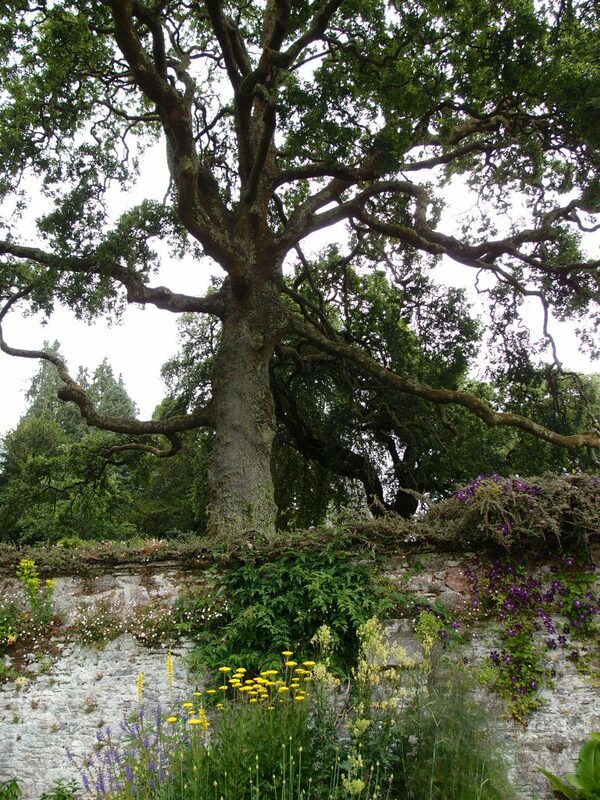 An ancient tree looms over the wall behind the Sunny Border. On the left: the Sunny Border. To the right: a line of highly-sculptural Irish Yews, which are called the Twelve Apostles. In 1830, twelve Irish yews were planted parallel to the southern-most stretch of the Sunny Border. 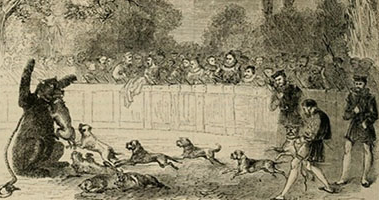 Per Dartington’s guide to the Gardens, “they may have been planted to shield an 18th century bear-baiting pit in the Tiltyard from the eyes of children (who lived) in the private house.” Bear-baiting (where bears were chained to posts and then attacked by packs of English bulldogs) was a favorite blood-“sport” of the aristocracy, which flourished until 1835, when it was finally outlawed. Bear Baiting. 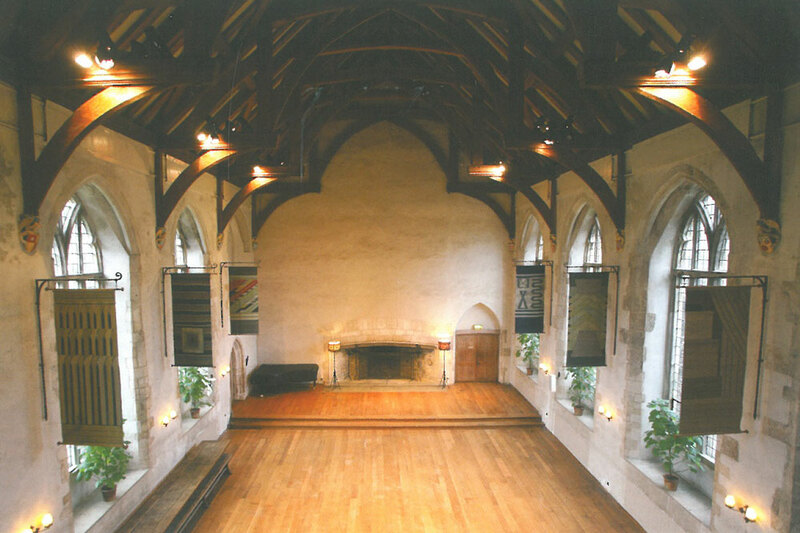 Image courtesy of Dartington Hall. confidently at the heart of the Gardens. Through the centuries, these over-scaled cascades of grass terraces which were carved into three sides of a naturally-occurring valley have framed 14th century jousting grounds (thus Leonard’s naming the space: “Tiltyard”) , an Elizabethan water garden, an 18th century bear-baiting arena, and a 19th century Lily Pond, which was then replaced by a formal Victorian garden. In the 19th century, walkways and shrubbery covered the bottom of the Tiltyard. 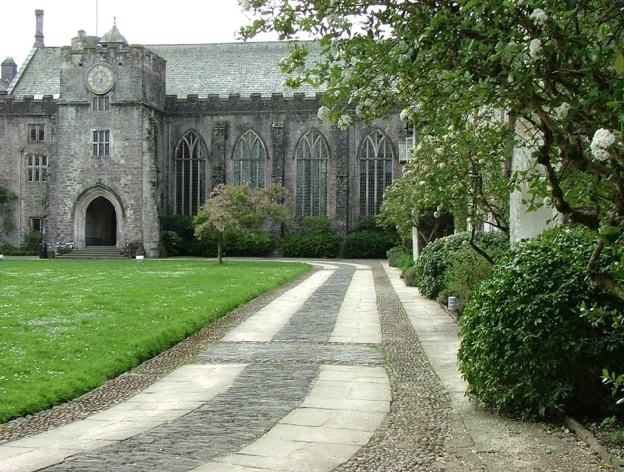 Image courtesy of Dartington Hall. 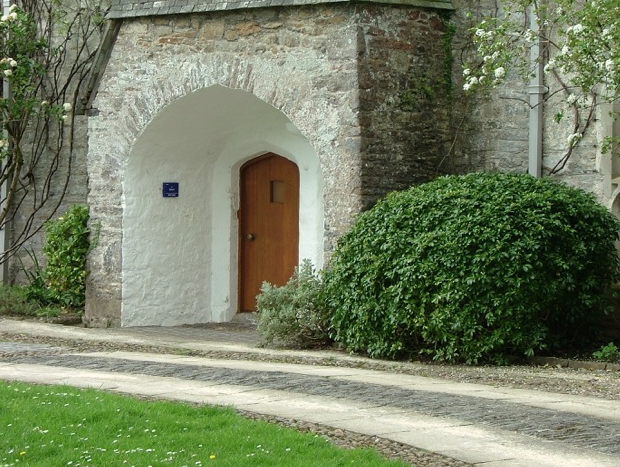 When the Elmhirsts first moved to Dartington, they transformed the Tiltyard’s formal garden into an open-air theater, but this idea proved unsuccessful. During the 20 years when the Tiltyard was called a “theater,” only 2 performances occurred there. The slopes and heights of the Tiltyard’s “steps” were far too steep and too tall for people to safely climb. Dorothy conceded that her outdoor theater idea had failed, both practically and esthetically; she finally understood that the true power of the Tiltyard could be unleashed by honoring its pure form. As I walked above, and around, and, finally, into the Tiltyard, I felt I was descending into a giant footprint; a concavity left by an upside-down, somewhat lopsided, and now long-departed ziggurat. Quite an image, eh? But this is yet another example of how the boldest and best designs can stimulate: both viscerally and intellectually! No photograph can adequately capture the dimensions of the precipitous slopes of the Tiltyard…especially those on its highest, western side. The super-human scale of the precisely-carved inclines feels simultaneously ancient and modern and inspires awe…along with a great respect for the groundskeepers who must mow the grass there. My view from the steps at the northern end of the Tiltyard, of The Sunny Border, Twelve Apostles, and Great Hall. Another view into the Tiltyard, from the Sunny Border. The orange barrier marks the spot where a majestic, 100-year-old Monterey Pine had just been removed. That tree was one of the first Monterey Pines to be imported to England, from California. Here’ s photo of the Now-Lost Monterey Pine that punctuated the west side of the Tiltyard’s Terraces. David, supplying human scale, at the north end of the Tiltyard. This flight of steps leads up to the Swan Fountain Terrace. Nan, on the Terrace by the Swan Fountain, overlooks the Green of the Tiltyard. 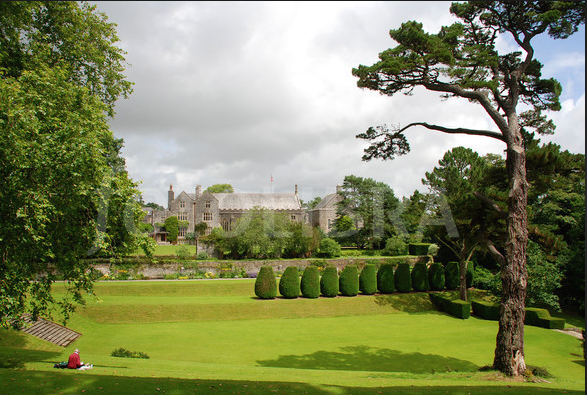 Part of the charm of the Tiltyard are the ways in which views of its precipitous slopes are often hidden, from other areas in Dartington’s Gardens. Photo by Anne Guy. To the north of the Tiltyard is a circular terrace that frames a Swan Fountain. Swan Fountain, made of Cornish granite. Presented in 1950 to the Elmhirsts by artist Willi Soukop. The Swan Fountain, in Springtime, when the shrubs in Percy Cane’s Azalea Dell begin to flower. 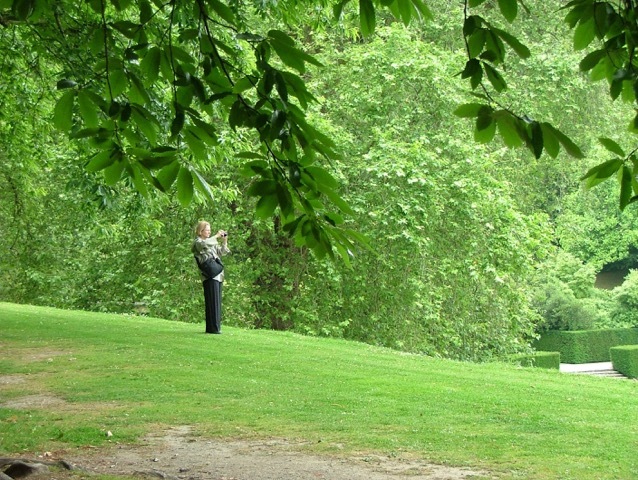 Image courtesy of Dartington Hall. We’re leaving the Swan Fountain, and making our way toward the Woodland Walks. Path leading into the Woodland, where Beatrix Farrand planted Yew, Bay and broadleaved Hollies as background material for camellias, magnolias and rhododendrons. The Woodland’s Flora was presented in 1967 to the Elmhirsts by the people of Dartington. Both Dorothy and Leonard chose to have their ashes laid to rest at Flora’s feet. And every day, a woodland spirit–or helpful neighbor–places a fresh flower in Flora’s hand. The statue of Flora marks a transition from Beatrix Farrand’s landscaping to that of her design-successor, Percy Cane. British landscape architect Percy Cane. Born 1881, Died 1976. As World War II ended, the Elmhirsts began to search for a new garden designer. In 1945, Percy Cane, who was a well-established English landscape architect, paid his first visit to the Elmhirsts’ Estate. Percy and Dorothy clicked, and so began their twenty-three-year long collaboration. 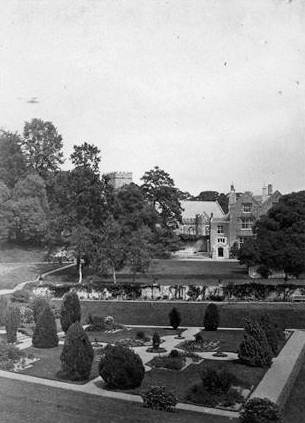 Whereas America-based Farrand had only been able to make a total of four site visits, Cane, who was based in London, eventually traveled more than 50 times to Dartington, as he supervised the construction of new stairways, terraces, structures, seating areas, pathways and gardens in eight distinct but related projects. with enticing vistas and graceful paths. And major clearing of overgrowth at the peripheries of the garden revealed stunning views out across Devon’s rolling countryside. 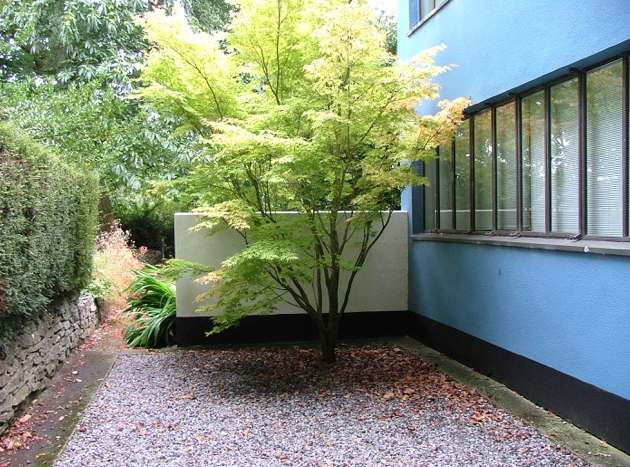 Whereas both Dorothy Elmhirst and Beatrix Farrand were tree lovers and plant experts, Percy Cane never professed himself a horticulturalist; his métier was the manipulation of space. Because of his near-quarter-century of work at Dartington, we can intuitively explore the sprawling grounds. With his new sightlines and pathways Cane injected an essential clarity and continuity into what had previously been a series of beautiful but unconnected garden areas. Despite its seeming complexity, this is a Map-Optional-Garden! High Meadow, designed by Percy Cane in 1949, arose from a completely-cleared corner of the property, where cutting flowers had previously been grown. High Meadow, abloom with wild orchids, during my visit in High Summer. Just south of High Meadow, Percy Cane erected The Temple, in 1960. This was my view downhill, through The Glade, as I stood in The Temple. Cane created The Glade by carving away undergrowth. He kept only the most shapely trees; then planted a central sweep of grass, flanked by shrubs. A spectacular cluster of 500-year-old Spanish Chestnut Trees towers over the western edge of the Tiltyard. The Chestnuts are Dartington’s most precious specimens, and were planted by the first of the Champernownes, when that family acquired the property. View from Spanish Chestnuts, over the Tiltyard, toward the Sunny Border. Spanish Chestnut Tree, with Henry Moore statue, in background. Henry Moore’s RECLINING FIGURE lounges above the southwest corner of the Tiltyard. Inscription on pedestal of Moore sculpture. View from site of Moore sculpture, across the Tiltyard, toward the Twelve Apostles. Another view across the Tiltyard, from the Moore sculpture site. entrance to Valley Field, below me. This is what touring a garden with me looks like: I’m wandering, alone, as I take in my surroundings and then frame the views with my camera. As I took the picture you’ve just seen, Anne photographed me. and, ultimately lead visitors to the mouth of the Valley Field. My view from the Heath Bank Stairway landing, back up toward the Tiltyard. The Valley Field, as seen from the Heath Bank Steps, which are at the south end of the Tiltyard. In the late 1950s, Percy Cane cleared many acres of scrub woodlands, and thus opened the longest vista in the Gardens. He then planted multitudes of Japanese cherries, maples, scarlet oaks, and sourwood trees in Valley Field. The Garden Summerhouse: designed in 1929, rebuilt after a fire in the 1980s. JACOB’S PILLOW, by Devon-based artist Peter Randall-Page, was added to the Gardens in 2005. View from Jacob’s Pillow, toward the Tiltyard. 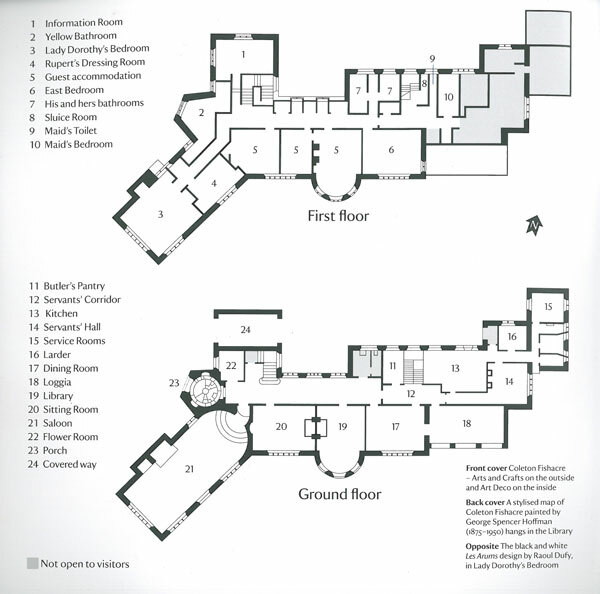 In 1930, the Elmhirsts engaged architect William Lescaze to design a headmaster’s house with a cutting-edge style that would match the School’s innovative curriculum. 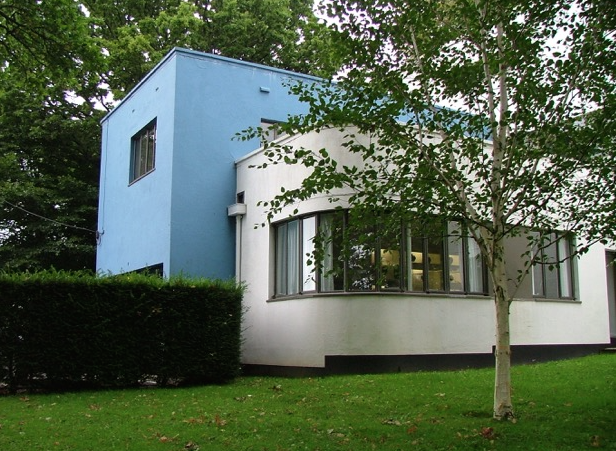 HIGH CROSS HOUSE: built in 1932 for the Headmaster of the Dartington Hall School. Photo by Anne Guy. 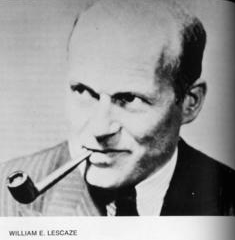 Architect Lescaze, and Headmaster W.B.Curry worked together to create a “machine for living,” and novel concepts such as kitchen ergonomics were explored. During the National Trust’s brief stewardship of High Cross House, this sign was on display. Photo by Anne Guy. But local contractors, who were inexperienced in non-traditional building techniques, made mistakes, which have ever since made the preservation of High Cross House costly and complicated. Headmaster Curry lived in his high-maintenance dream house from 1932 until his retirement in 1957. In its heyday, 300 students were enrolled at the School. In 1987, the School was closed. In January of 2012, High Cross House, which is just a short stroll from the Estate’s Gardens, was leased to the National Trust for 10 years. 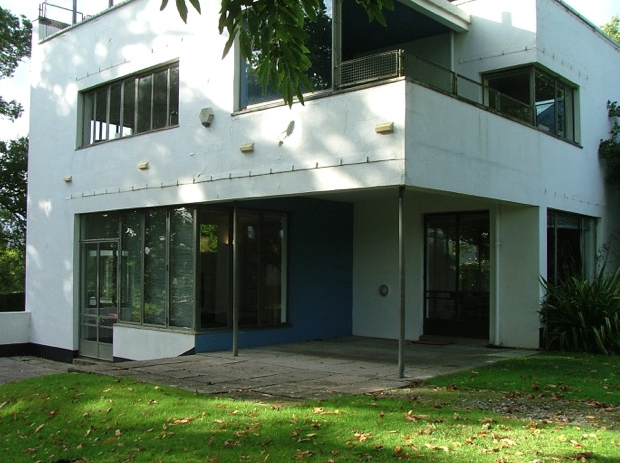 Anne and David Guy, those ever-alert travelers, were among the first to visit the House, which is considered to be one of the United Kingdom’s best examples of modernist architecture. High Cross House. Photo by Anne Guy. 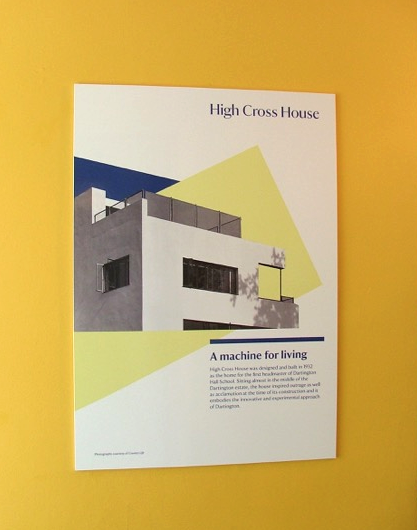 High Cross House (this is the shot that makes me want to live here). Photo by Anne Guy. High Cross House, Living Room. Photo by Anne Guy. 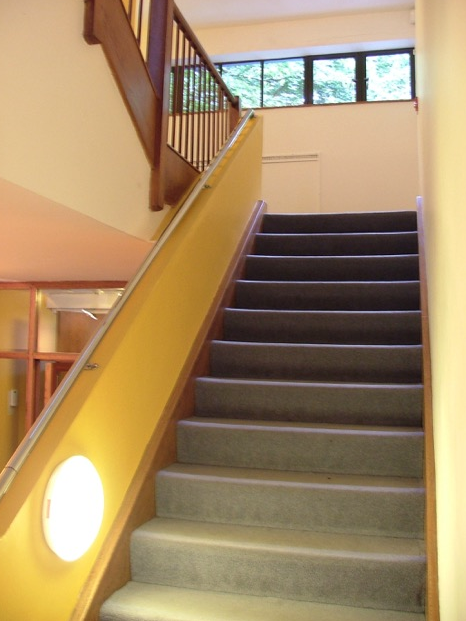 High Cross House, Stairway Hall. Photo by Anne Guy. 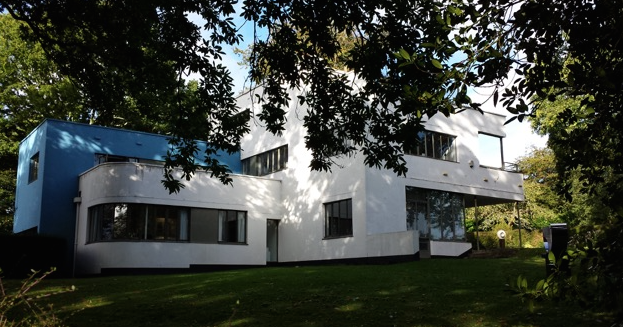 And so today, High Cross House, which the National Trust called one of “the top five Modernist houses” in the United Kingdom, remains closed and untended. We are fortunate that Anne Guy took photos of the House in 2012, while it was being well cared for. The previous morning had greeted us with cold and fog, but Thursday’s weather had upped the ante, with torrential rain and winds. Despite all, we bundled up, turned our backs upon our cozy Dartmouth cottage, and forged onward and outward, into the deluge. We traveled east, across the River Dart, to yet another garden: this one on Kingswear’s seacoast. Vehicles packed tightly, on the auto-ferry. This ferry uses cables, both for its propulsion and guidance: clever, and energy-efficient! 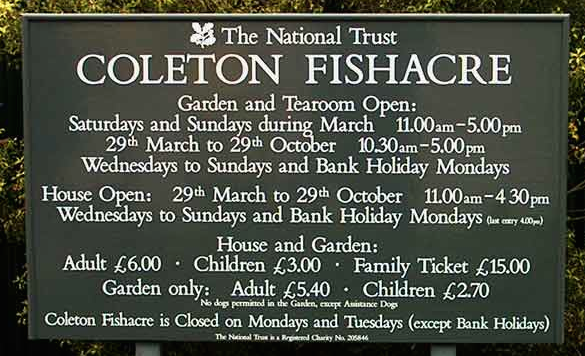 Coleton Fishacre: just a hop, skip, and ferry ride, to the East of Dartmouth, in Southern Devon. A fair-weather view of Rupert and Dorothy D’Oyly Carte’s opulent, 1920s, seaside retreat. Image courtesy of the National Trust. My first glimpse of the House at Coleton Fishacre. …I think not! 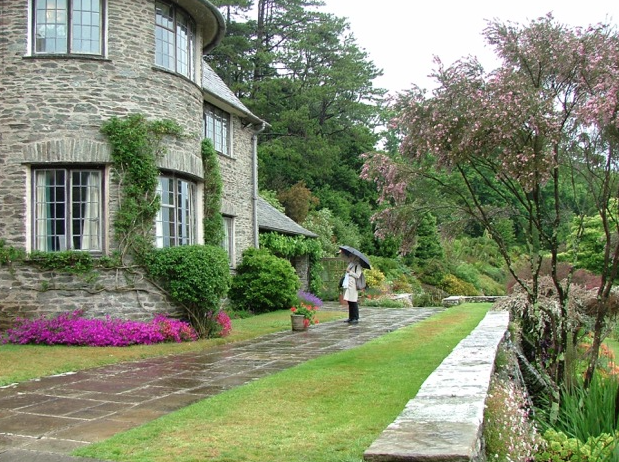 For anyone who has shivered while reading Daphne duMaurier’s REBECCA, the stone house which loomed ahead seemed a cousin of the author’s haunted Manderley, which she had placed in nearby Cornwall. The Forecourt is paved with granite, laid in a radiating pattern. The dimensions of this front entry drive were determined by the turning radius of the D’Oyly Cartes’ Bentley. As we sloshed through a heavy downpour toward the fog-shrouded House, it crossed my mind that, lurking inside, there ought to be a National Trust Docent who looked like a Mrs.Danvers-Clone. Judith Anderson played Mrs.Danvers in Alfred Hitchcock’s 1940 version of REBECCA (which, though accurately depicting Menacing Atmospherics, fudged a major plot point, and in so doing robbed duMaurier’s story of its complexity and ultimate impact). We crossed the somber, stone threshold. And inside? Nary a Mrs.-Danvers-Clone-Docent to be seen. Instead, I was surprised to discover a pristine, light-filled interior. The National Trust describes the interiors as “Art Deco in Devon,” but this characterization is incomplete. The house’s spaces — where whitewashed walls meet ceilings in smooth, continuous curves; where rooms are sparingly decorated with a tightly-edited blend of accents taken from Arts and Crafts, Art Nouveau, Art Deco , Oriental and Baroque styles — are serene and comforting. There’s no Jazz-Age Jitteriness in those rooms…no brittle, Art-Deco Sheen in the place. For the next hour, my companions and I explored the house, as we waited for the weather outside to improve enough to make our eventual garden stroll something other than a soaked-to-the-skin ordeal. with renovations to Claridge’s, the Savoy, and the Berkeley Hotel. Despite working non-stop each week in London, on weekends Rupert returned to Coleton Fishacre, where he supervised all aspects of his gardens. Savoy Theatre Poster. Image courtesy of the National Trust. Lady Dorothy Milner Gathorne-Hardy D’Oyly Carte (born 1889, died 1977). The 3rd and youngest daughter of the 2nd Earl of Cranbook, Dorothy married Rupert in 1907, and became a full partner with him in the design of their gardens at Coleton Fishacre. In 1932, after their 21-year-old son Michael died in an auto accident, their marriage began to crumble: in 1941 Rupert divorced Dorothy for adultery. Soon thereafter, she moved to the Bahamas, where she married St.Yves de Verteuil who was her co-respondent in the divorce case. 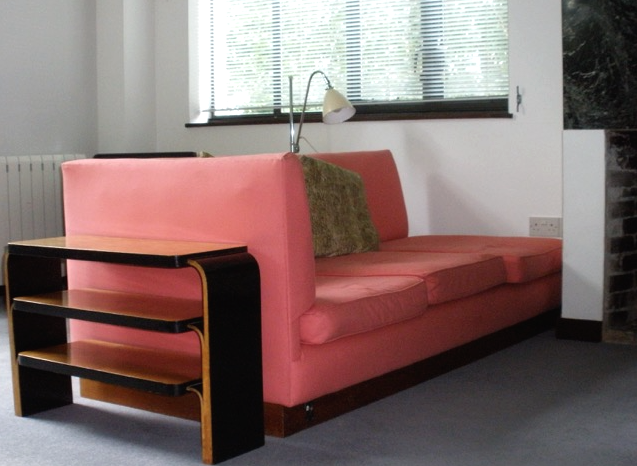 While adeptly interpreting the Arts and Crafts style in his busy practice of building country homes, Oswald Milne also became a pioneer in the design of Art Deco interiors, throughout Britain. Milne’s most famous interiors were his 1929 transformations of Claridge’s Hotel (also owned by Rupert D’Oyly Carte), in London. 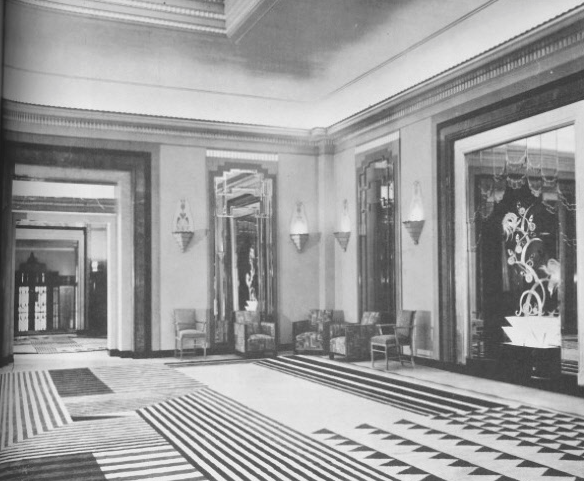 Oswald Milne’s most acclaimed Art Deco interiors were designed for Claridge’s Hotel. This photo taken in the 1930s. Let’s begin our tour of the House, which the National Trust now presents largely with furnishings that are correct to the period, but are not originals from the D’Oyly Cartes’ time there. In 1930 COUNTRY LIFE published an extensive photo-spread about the interiors, and the National Trust referred to those pictures as they sought replacement furniture and accessories. [ Note: Where original furnishings are on display, I’ll identify them. ] 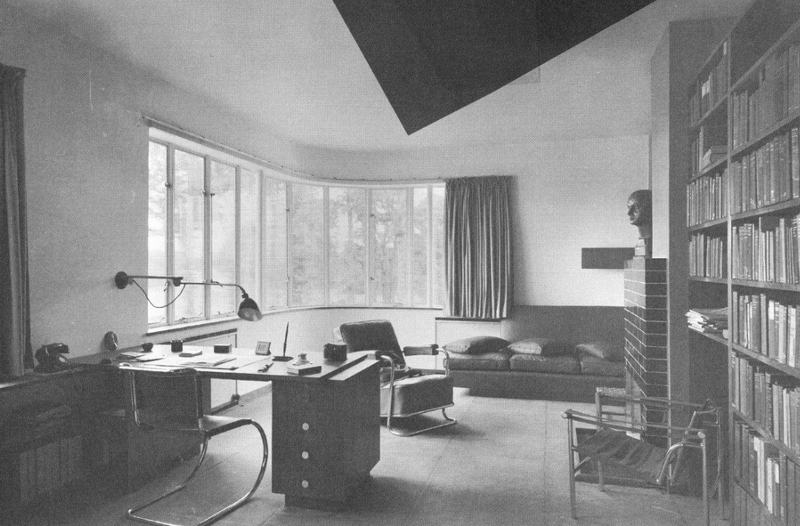 Insofar as Oswald Milne’s architecture goes, the rooms remain as he built them, in 1923. We’ll follow the National Trust’s recommended route, and will pass from the circular Front Entry Porch, through the Front Hall and its adjacent Flower Room, and then directly upstairs, to Lady Dorothy’s Bedroom. 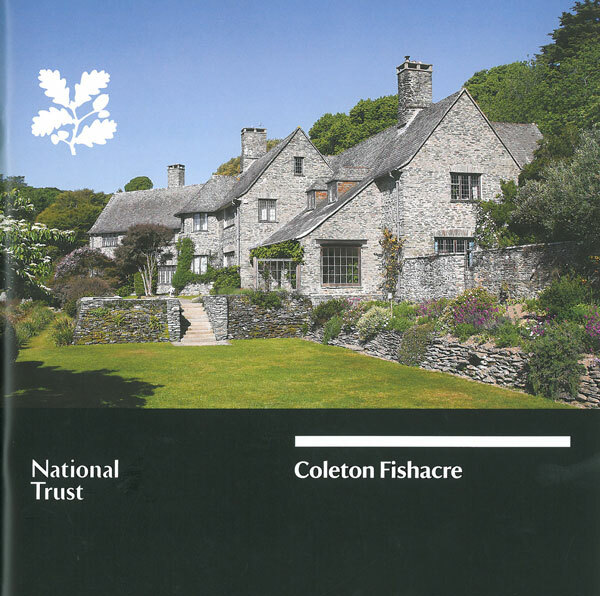 Coleton Fishacre: House Plans. Image courtesy of the National Trust. Vases, ready for fresh cut flowers, on shelves in the Flower Room. This was Dorothy’s domain. Main Staircase, Front Hall. The woodwork here is paneled pale, limed oak. Lady Dorothy’s Bedroom — one of the largest of the House’s seven bedrooms — is today presented to appear just as it did, when photographed by COUNTRY LIFE, in 1930.
planted in the steep, narrow valley. View of the Rill Garden, from Dorothy’s and Rupert’s Bedroom. with new yardage of the same black and white fabric (style: Les Arums, designed by Raoul Dufy) that was first used, throughout this bedroom. In Dorothy’s Bedroom: the over-mantle painting is original to the House, as is the cupboard to the right of the fireplace. The near-black Axminster carpet was woven to replace the original. 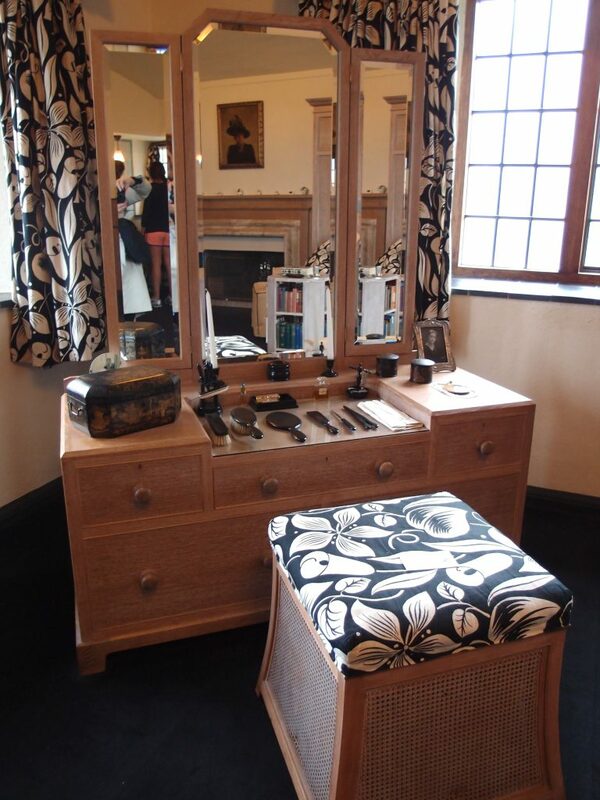 In Dorothy’s Bedroom: a traveling-case, typical of the 1930s. A chair to COVET, in Rupert’s Dressing Room. were installed. Rupert had used identical materials when he refurbished his Savoy Hotel, in London. 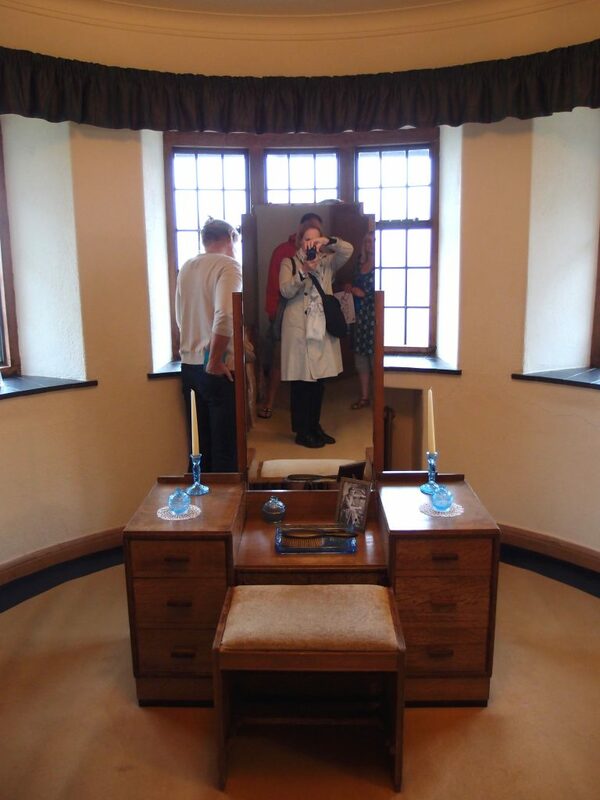 Turret Guest Bedroom, furnished by the National Trust with Heal’s oak furniture, from the 1930s. economy by retraining residents in many highly-skilled trades. Those residents then went into business as cheese-makers, carpenters, farmers and glass-blowers. Dartington Glass was founded in the early 1960s, and is still prospering. Bedroom Corridor. The ceiling light is original to the House. Note: the entrance to Lady Dorothy’s bedroom is at the far end of the hall. When his marriage to Dorothy disintegrated, Rupert moved into the East Bedroom, which also had fine views of the garden, and of the ocean. View from the East Bedroom…trust me, despite the blanket of fog outside in this photo, you WILL soon see the gardens. Throughout the house, all of its mullioned windows have ironwork fittings, and are set above black Staffordshire tile sills. From the East Bedroom, we headed downstairs, via the servants’-stairs, to the Servants’ Corridor, Kitchen, and the House’s other utilitarian rooms. In the Servants’ Corridor: The Electric Bell Board is original, and still in working order. The Kitchen’s double Belfast sink, and the plate rack above it, are original to the house. The Servants’ Hall has a fine view (really) of the gardens. The D’Oyly Cartes employed a butler, housekeeper, housemaid, cook, and chauffeur, all of whom lived on the Estate. 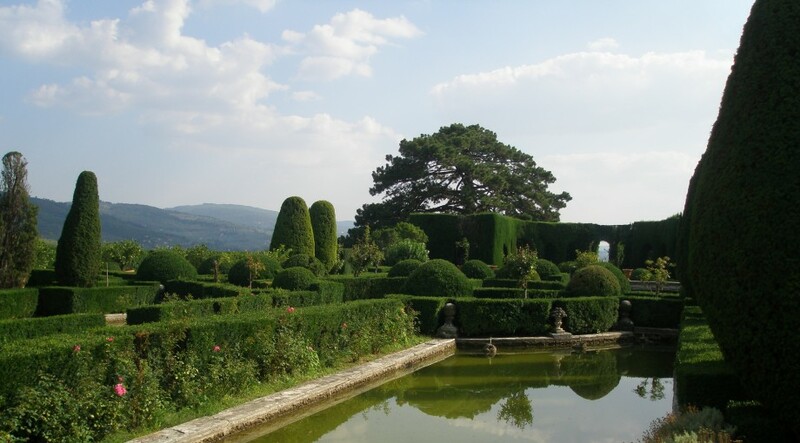 Their gardens required additional, seasonal staff: a landscape architect, a Head Gardner, and six gardeners. The Drying Room, where wet clothing was hung, after it had come from the Laundry. There was also a Brushing Room, used (you guessed it) to brush clothes, and to clean shoes and boots. View from Laundry Room, into Service Court (with Forecourt beyond the arch). Dining Room. Image courtesy of the National Trust. My first view of the Dining Room. The Lalique wall lights are original. Miraculously, the fog had begun to lift. Here’s our Dining Room view of the Terraces, over the Upper Pond Garden, and across to the West Bank. A closer look at the over-mantle painting. Image courtesy of the National Trust. Rupert’s desk occupied the prime spot in the Library. 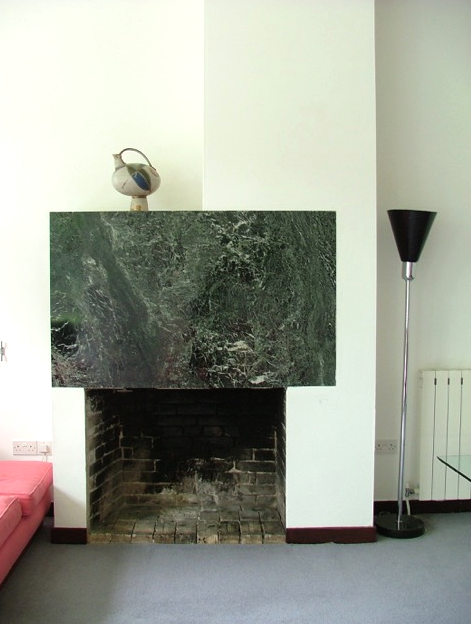 The Sitting Room mantle is carved from limestone that is rich in fossils. 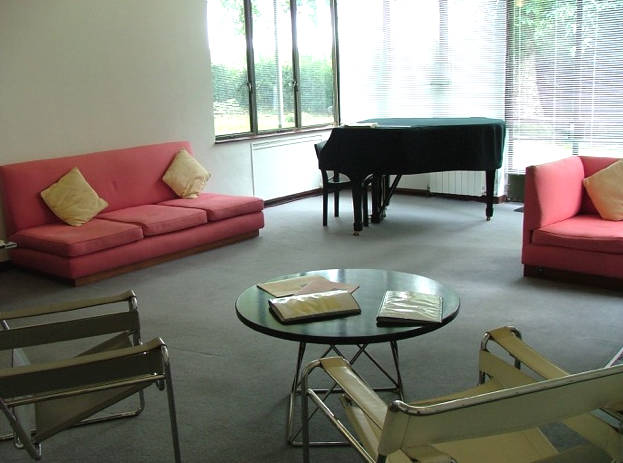 The Sitting Room’s windows open to the Top Terrace, just outside. And the final stop, on our House Tour: The Saloon. My first view of the Saloon. I’m not sure I agree with the National Trust’s positive assessment of this nearly 40-foot-long space. Standing in the doorway to the Saloon, I felt as if I was about to begin walking a Plank…. But, once down the steps, and into the Saloon-Proper, the extreme linearity of this room was offset by expanses of garden-facing windows, and French doors. carpet, which was custom-made in the late 1930s by American textile designer Marion Dorn. The carpet we see today is an exact reproduction of Dorn’s floor covering. Such superb textiles SHOULD be signed by the artist! from 1895-96, and which was bought for this room by the National Trust, in 2002). Having enjoyed our young musician’s impromptu piano performance, we proceeded to the front porch, where we were cheered to discover that the morning’s chilly torrents of rain had been replaced by a soft, warm drizzle. ‘Twas time for our Garden-Tromp. Our drizzly but encouraging view of the Forecourt, from the front porch. 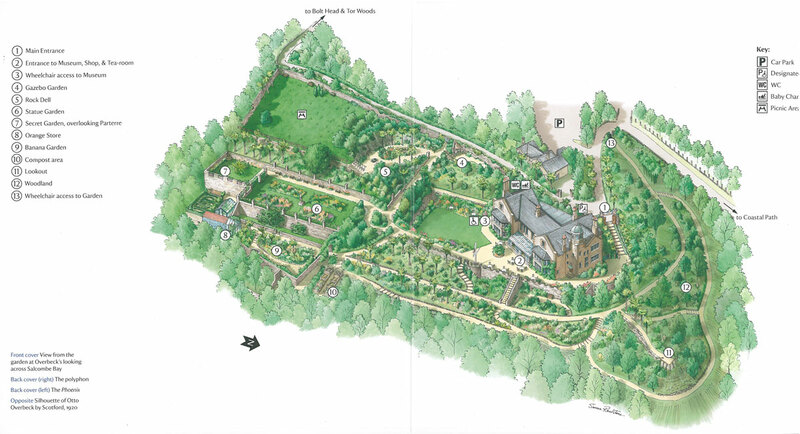 Plan of the gardens at Coleton Fishacre. Image courtesy of the National Trust. Pictures from our long ramble through the gardens will appear in their actual, meteorological sequence. By early afternoon, the weather had begun to improve: the fog lifted…the rain calmed itself into a drizzle…and after a bit even the drizzle was exhausted. A light breeze arrived, clouds scudded out to sea, and, suddenly, soft warm air and brilliant sunshine transformed Coleton Fishacre into a place which felt and looked entirely new. Remember, if you’re displeased by England’s weather conditions, be patient: odds are, the skies’ll change. We’re headed toward the Terraces which are on the south side of the House. Towering above us: the Southwest wing of the House, with Saloon on the ground floor, and Lady Dorothy’s bedroom on the upper floor. I inspect the Top Terrace. The Saloon and the Loggia both open directly onto this Terrace. Photo by Anne Guy. Above the Loggia’s roof: a weather vane, which celebrated Rupert’s love of fishing. A sundial is mounted on the top-most portion of the Saloon-wing wall. Climbers are happy, clinging to the Dartmouth Shale Stone walls of the House. Many of these climbing plants survive from the D’Oyly Cartes’ time. From the Top Terrace: a look at the borders which are planted on both sides of the Upper Pond. By the southwest corner of the House, a cascade of steps connects the Top and Middle Terraces. At the east end of the Bowling Green Lawn, a grass path leads to the Gazebo; and, farther east, to Cathedral Bank; and finally, to Pudcombe Cove. Bench, at eastern end of Bowling Green Lawn, with Exotics garden behind. The Pool on the Middle Terrace is fed by a stream that originates beyond the north side of the House. The otter was carved from Cornish Polyphant soapstone to replace an earlier Portland stone sculpture. View from the Top Terrace toward the walls enclosing the Rill Garden. The Rill Garden was designed by Oswald Milne. This hillside garden is bisected by a narrow, canalized stream and a small, central pool. Lady Dorothy originally planted many pastel-colored rose bushes here, but those shrubs failed, in the seaside air. Semi-tender perennials now fill the Rill Garden. 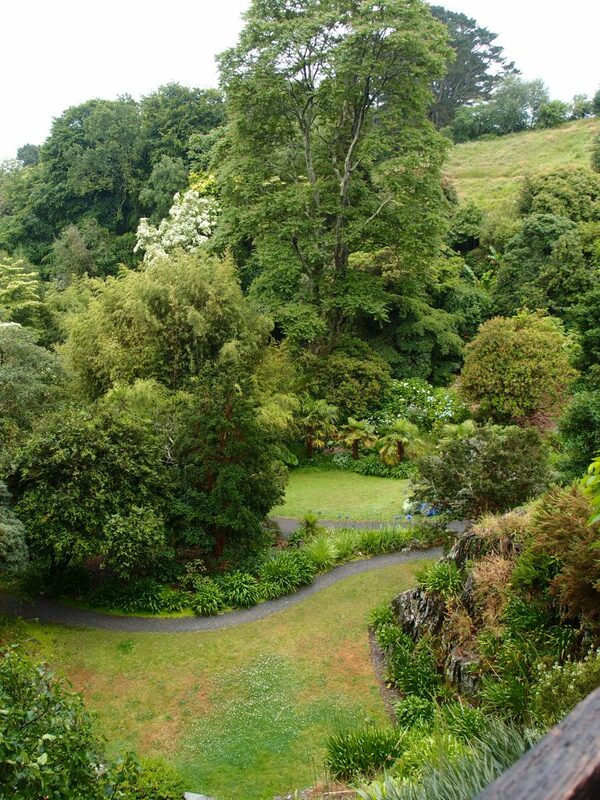 Our uphill view of the Rill Garden, which was built in 1926. In 1926, while the House was being constructed, two dams were built in the stream which runs from the property’s western hillside, down to the eastern seashore. The Upper and Lower Ponds were thus formed. Lush plantings around those bodies of water now give each Pond a natural appearance. View of the House’s Saloon wing, from the Rill Garden. All of the stone walls, terraces and steps in the gardens were built as the House was being constructed. The Rill Garden’s stream is routed downhill–toward the Upper and then Lower Ponds–through this opening, which is beneath the lowest lip of the Rill Garden. Proceeding downhill from the Rill Garden, we strolled past the lushly-planted Upper Pond borders. To the rear of the House, those tall pines are just a few of the 10,000 trees which were planted by the D’Oyly Cartes. After passing the Lower Pond, we continued to follow the stream, downhill into the Glade. We followed the Coastal Footpath to Scout’s Point (aka Lands End), where we were presented with this rainy view of Pudcombe Cove. Below Scout’s Point: steep, cave-filled cliffs, and the clear waters of Pudcombe Cove. “The Cove has been inaccessible to visitors since 2001, due to the perilous state of the steps, caused by coastal erosion and rock falls. The National Trust, in line with its policy not to interfere with natural coastal processes, is allowing nature to take its course, which will mean the eventual loss of” all of the D’Oyly Cartes’ additions to the Cove. At Pudcombe Cove, the rocks of England are tumbling back into the sea. which are on the eastern slopes of the Cathedral Bank. Half-way up the Long Close, I paused to gain my breath. Turning back toward the Ocean, I was rewarded with this wonderful, albeit still-rain-soaked, view. The Panorama: seen from the top of Cathedral Bank. to facilitate the transport of tons upon tons of shale. Leaving the Gazebo (don’t worry, I’ll show you the Gazebo, once the weather clears…) , we headed back toward the Bowling Green Lawn, through a garden planted with Exotics such as yucca, bromeliad, protea and echium. Soggy and famished, ‘twas time for a dry-out and a lunch-break, and we retreated to the Visitor Centre Café. But just as we were polishing off our meals, sun abruptly shined down upon Coleton Fishacre….which meant that we’d have to take another trot around the gardens. And so we approached the House for the second time that day: and the place had been Utterly Transformed. In my first circuit through the gardens, I’d missed the area closest to the entrance drive: Seemly Terrace. View of the distant West Bank, from the Seemly Terrace gardens. We’re in Seemly Terrace, which was also created by Oswald Milne, in 1926. We’re at the southernmost edge of the Rill Garden, which is directly below Seemly Terrace. Behind the House: the tall pines of the shelterbelt. to signal that the time was nigh for cocktails, back at the House. The rectangular pool and fountain on the Lower Terrace (with the Library’s Turret wing directly above). The retaining walls of the Lower Terrace are covered with Mexican daisies. Let’s wallow some more in the COLORS of the Hot Border. The stairs in the background lead up to the Bowling Green Lawn. Rupert chose the Hot Border plantings….remember, he was a Showman. We’re on the Terraces, looking southwest. at the corner of the Bowling Green Lawn. And now, from the opposite end of the Upper Terrace, another glimpse of the ocean. And I suppose I ought to mention the ANTS. This is a view of the West Bank, from the Terrace Steps. The West Bank’s most peculiar feature: its large anthills, which have remained undisturbed for hundreds of years. The huge tree in the center of the Bank is a Persian Ironwood. My view of the Saloon wing, from the West Bank side of the Upper Pond borders. We headed back through the Exotics Garden…. …our destination: the Gazebo, which was designed by Oswald Milne in 1926. The hexagonal Gazebo, with stone pillars and wooden trellis supporting wisteria, has a spectacular ocean view. When first built, the Gazebo also had a clear view, back to the House. Nan…doing a bit of sun-basking, in the Gazebo. Photo by Anne Guy. My view from the Gazebo, down to the path which leads from the Quarry, through a wooded area, and further downhill to Cathedral Bank. My final view of the English Channel, from the Gazebo at Coleton Fishacre. To have been able to visit three such splendid gardens as Overbeck’s, Dartington Hall, and Coleton Fishacre — and on consecutive days — was an enormous privilege. Sometimes as I travel, this abundance of daily wonderfulness begins almost to seem normal. But afterwards comes the necessary Reality Check … provided by my most-of-the-time-quiet life at home, here in rural New Hampshire. I’m glad that distance — in time and in miles — ultimately separates my garden touring from the making of these reports about my journeys. From those separations come perspective. The most conventionally beautiful bits of landscaping (think “Capability Brown,” who I admire less and less, and about whom I’ll write some more, in future) — those places that obligingly serve up the generic pleasures of lush borders and tasteful ornamentation and long views -– are sometimes not the gardens which most deeply resonate, months later, as I’m sitting in my office chair and sifting through my photo archives, and reviving my memories. Instead, the gardens that most make me ache for another ramble through them are those where the sensual experience of garden strolling is enriched by information that personalizes each landscape. Learning about the travails and quirks of the people who created those places makes me feel as if I’m visiting a Home, instead of an Attraction. It’s essential that we remember that each of these magical environs was at first just a figment of an imagination. Only through subsequent leaps of a founder’s faith — and accompanied by enormous expenditures and sustained efforts — were those imagined places then transformed into real gardens. 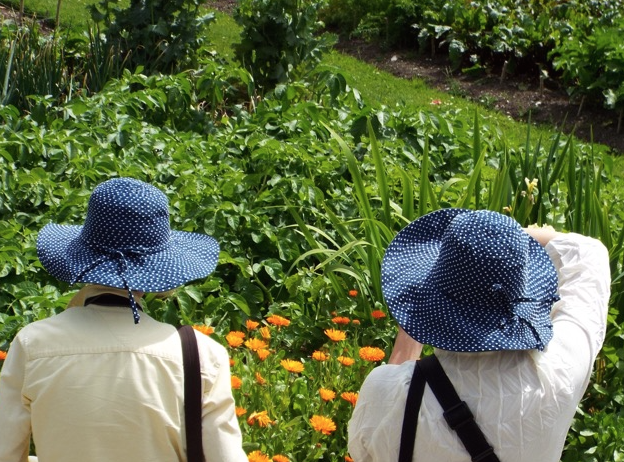 In the most satisfying of England’s historically-significant gardens, the dirt and stone and plant material which astound today’s bus-loads of garden-gawkers were all originally chosen to solidify the visions of only one or two souls. The best gardens are the embodiments of the dreams of their makers: such gardens were not made to please you … or me! I think of the brilliant and nutty Otto Overbeck, who attempted to cure the ills of mankind (administering one electrical jolt at a time), while he also made a huge leap into the Horticultural Unknown (ordering 3000 palm trees be planted in his English garden) . 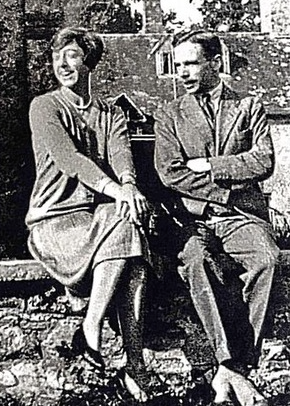 I marvel at the prodigious energies of Dorothy and Leonard Elmhirst, who restored their ancient Dartington Hall, while they simultaneously nurtured the talents of innovative landscape designers and avant garde architects…and who then (never content to rest upon their laurels) also established progressive schools and local businesses. Copyright 2016. Nan Quick—Nan Quick’s Diaries for Armchair Travelers. Unauthorized use and/or duplication of this material without express & written permission from Nan Quick is strictly prohibited. Breathtakingly fresh — I can almost taste the mist! How do you make each installment so visceral and unique?! As in all your work on these diaries, I adore the many levels — horticulture, art, architecture, history, drama, romance — interwoven into your accounts. And the clever, little personal inserts such as “Nan clicking away in the Turret Guest Bedroom.” (I found especially endearing is the photo of “geeky parents” and sober child.) Bravo, once again! You have outdone yourself. Engrossing and worth waiting for! I am inspired to follow in your footsteps! Another great post Nan and a great way to spend a wet afternoon reliving our great trip together in Devon…roll on our next trip to Wiltshire!!! Hi Nan, I arrived here thanks to Anne and it’s absolutely lovely to see some of my favourite places through your eyes. Last week i went back to Overbecks for the first time in about twenty years and I love how you described the drive – I knew there had to be some reason why it took that long for me to return! I’ve been having withdrawals from Dartington from a while and hope to meet Jude, a special blogging friend there this summer. We have lots of similar photos Nan and I’m glad that you enjoyed your time in my county.